A B ‘Banjo’ Paterson (1864-1941) was born near Orange in New South Wales. He worked as a lawyer's clerk before becoming a solicitor. After the publication of The Man From Snowy River and Other Verses in 1895, he became something of a celebrity, travelling widely throughout Australia. He was a war correspondent in the Boer War in South Africa, and the Boxer Rebellion in China. He later became editor of the Sydney Evening News. He is perhaps most famous for having composed the words to 'Waltzing Matilda'. The artwork in this book is gorgeous, the whole book is fantastic. The poem is one that most Australians would know, it is one of my childhood favourites. I purchased this as a gift for my sister, but will be buying my own copy soon. The only con that I can say, is that I would love a hardcover copy, to keep it safe! 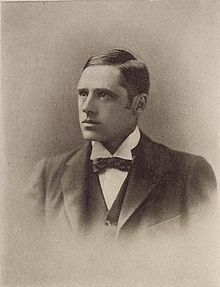 Andrew Barton 'Banjo' Paterson (17 February 1864 - 5 February 1941) was an Australian bush journalist and author. He was popularly known as "Banjo" Paterson from his pen name, "The Banjo". He wrote many ballads and poems about Australian life, focusing particularly on the rural and outback areas, including the district around Binalong, New South Wales where he spent much of his childhood. He best known for his rousing folk classics The Man from Snowy River and Waltzing Matilda, is widely acknowledged as Australia’s greatest and most popular balladist. His poems, written with great gusto and humour, celebrate all the romance and rough-and-tumble of old Australia. Banjo Paterson was born at Narambla, near Orange, New South Wales, the eldest son of a Scottish immigrant from Lanarkshire on February 17, 1864. Paterson's family lived on the isolated Buckinbah Station until he was 5. When Paterson's uncle died, his family took over the uncle's farm in Illalong, near Yass. When Paterson turned 10 he was sent to school at Sydney Grammar School, performing well both as a student and a sportsman. Leaving school at 16, he took up the role of an articled clerk in a law firm and by the age of 23 Paterson was a fully qualified solicitor. In 1885, Paterson began submitting and having his poetry published in the Sydney edition of The Bulletin under the pseudonym of "The Banjo", the name of a favourite horse. Paterson, like The Bulletin, was an ardent nationalist, and in 1889 published a pamphlet, Australia for the Australians which told of his disdain for cheap labour and his admiration of hard work and the nationalist spirit. In 1890, The Banjo wrote The Man from Snowy River, a poem which caught the heart of the nation, and in 1895 had a collection of his works published under that name. This book is the most sold collection of Australian Bush poetry and is still being reprinted today. A B (Banjo) Paterson also became a journalist, lawyer, jockey, soldier and a farmer. In 1903 he married Alice Walker in Tenterfield. Their first home was in Queen Street, Woollahra. The Patersons had two children, Grace born in 1904 and Hugh born in 1906. He would later become a war correspondent for The Sydney Morning Herald during the Second Boer War, the Boxer Rebellion and World War I.